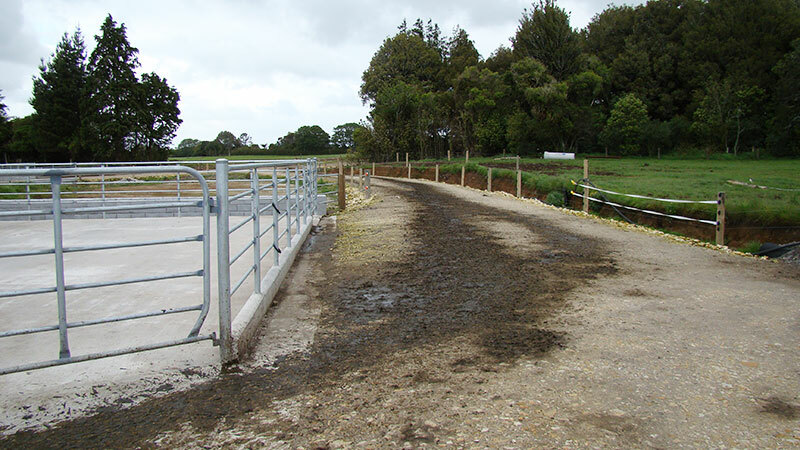 The surface of the yard is different to the track and it can be a common problem area for cows. The intersection needs to be well designed and maintained. Less lameness. Happier cows with surer footing. Less maintenance, especially if the surface is designed to withstand high traffic levels and doesn’t accumulate water. More efficient. Unrestricted cow flow into the yard and faster milking. What makes a perfect intersection? Six attributes your intersection should have. Lime fines help keep the track intersection dry. Placing lime fines on the first 40 metres helps to keep the track intersection area dry. The lime fines need to be about 100mm thick. Use pieces of timber or railway sleepers along the edge to keep the lime in place. Lime fines work well because they are not abrasive to hooves when carried onto the yard surface. If the surface of the track-yard intersection starts to break down, put in a temporary solution until you have time for a full repair. Shredded pine, wood shavings, wood chips, hay and straw are all practical, short-term solutions – they soak up moisture to reduce the bogginess and cover any exposed stones creating a comfortable walking surface. But don’t put off a permanent solution too long. 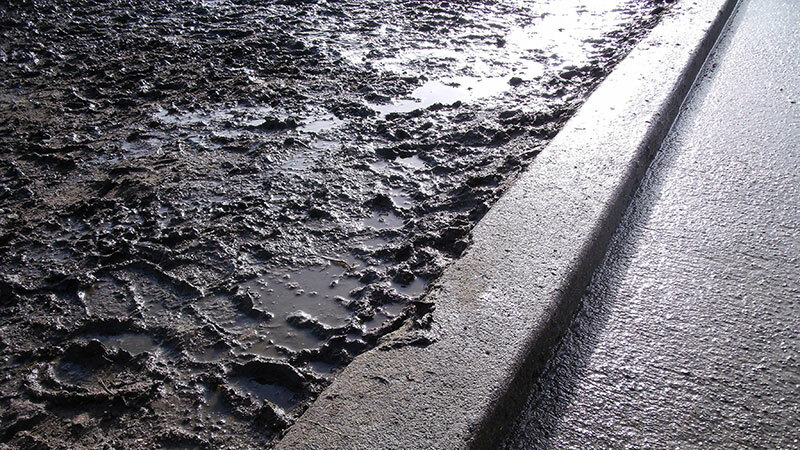 Water from yard washing or rainfall can drain directly onto track-yard intersections if not diverted and the area will become muddy, slowing cow flow. A wet slow intersection will increase effluent. 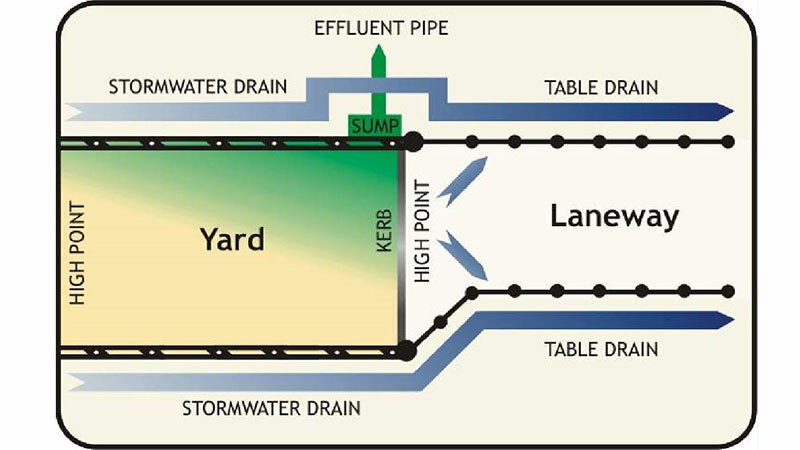 This can be an environmental concern if the run off can enter a waterway or drain. The easiest way to drain water from the intersection is to make it a high point. This can be created by sloping the track section up to the intersection, then sloping the concrete section to divert wash water away from the intersection. A kerb at the track-yard intersection prevents the wash water from flowing onto the track. A 50-75 mm kerb at the track-yard intersection helps to keep the track dry. A nib wall at the leading edge of the concrete stops stones moving onto the yard without significantly disrupting cow flow. Nib walls should be 50-75mm high. If nib walls are any higher, cows may damage their dew claws. When resurfacing tracks, ram the material hard next to the nib wall to ensure it is firmly packed and stops large hollows forming. 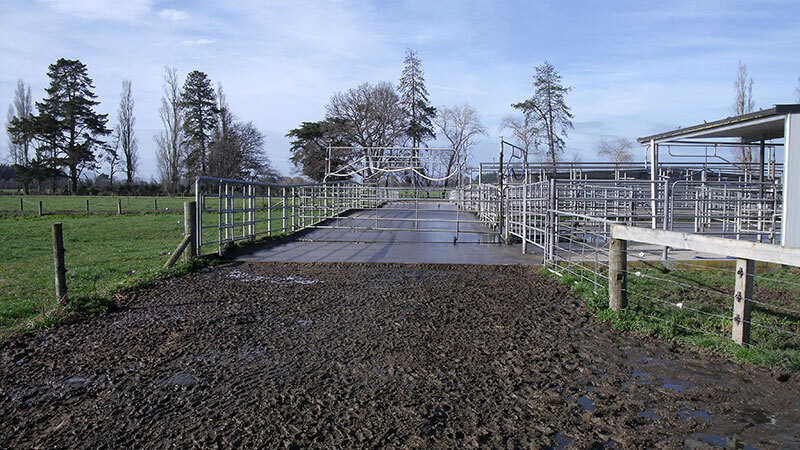 In yards where there is a drain crossing the yard, covering the grate with carpet at the beginning of the season may help nervous heifers cross it. Installing a drain on the yard side of the kerb will help liquid drain away from the intersection. Keep in mind that kerbs can impede cow flow if cows don’t have sure footing on either side. Keep both sides of kerbs clear of stone build ups like this. They can slow cows down and damage feet. When cows walk onto a concrete yard or track section they can carry gravel and pebbles with them, particularly if the intersection is muddy or inadequately constructed. These small stones will damage cows’ feet if they fall on the yard. A stone-free, soft surface in the lead up to the intersection can act as a stone trap. Place 40 to 100 metres (the amount needed will depend on your track design) of lime fines before the start of the concrete. Coarse pine bark, wood chips or sawdust can also be used. Carpet or other matting on the first section of concrete can trap stones effectively. 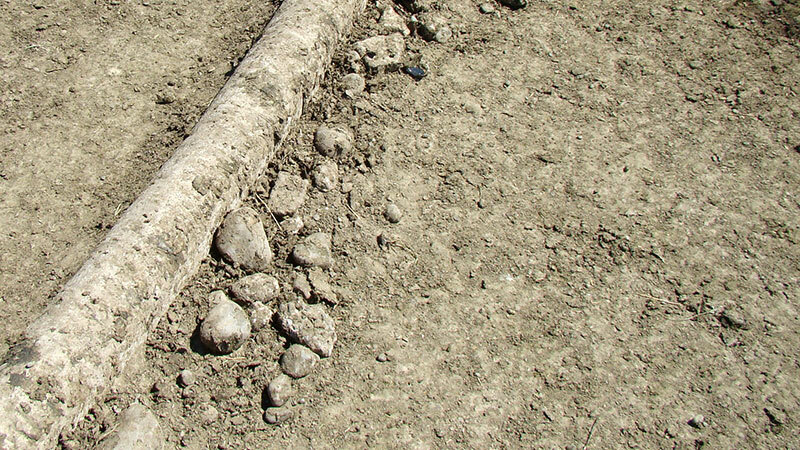 Kerbing acts as an effective stone trap when cows lift their feet clear of the ground. This creates an opportunity for stones and pebbles to fall off. Two kerbs will make cows lift their feet twice and stones are dropped between the two kerbs. Clean out stones and debris from stone traps regularly. 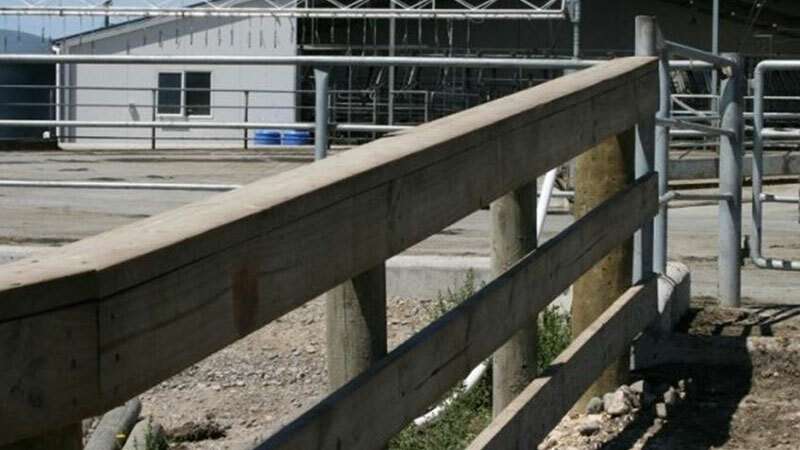 Wooden railings at the yard entry are stronger and more cow friendly than post and wire. For areas exposed to high stock pressure i.e. for the last 10 – 20 metres before the yard entry, make sure the fence is strong enough. This is often a pressurised congestion point where fences are easily wrecked and cows are pushed onto electric fencing which will have a negative impact on their behaviour around the yard. Wooden railings at the yard entry are best as injuries are kept to a minimum, but a well constructed post and batten fence is an alternative. Full width track entry into yard. Yard entrances should be the full width of the track otherwise they will impede cow flow. Gates should not interrupt cow flow and should be easy to manage. If alterations to the width of tracks do need to be made, the section closest to the dairy should be widened first. Access to the yard should be at least the full width of the track. Exposed hinges will catch cows as they pass by and hurt them. Long single gates can be swung off a large, well secured post if suitable gate stays are used, or if a wheel is attached at the end. Staying is essential if the gate is to latch correctly every time it is closed. 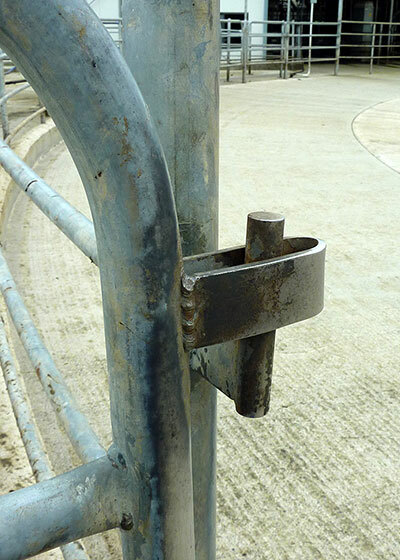 An unlatched gate that shuts during cow entry will cause disruption to cow flow and milker frustration. Put in hitches so that gates don’t blow or get knocked shut. Hang gates far enough off the fixing post so that hands and fingers cannot be jammed between the gate and post. Keep hinges to the side of the post so that cows don’t hit or hurt themselves. Well designed, constructed and maintained tracks will save you time and money. Find out here what makes a perfect track. Well integrated cattle handling facilities make completing animal health tasks more efficient and safer for stock handlers and cows.